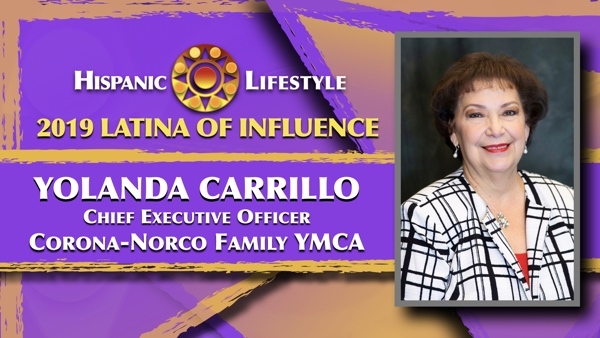 Hispanic Lifestyle is pleased to recognize Yolanda Carrillo Chief Executive Officer of the Corona-Norco Family YMCA as a 2019 Latina of Influence. Ms. Carrillo along with our entire list of 2019 Latinas of Influence are invited to participate in Latina Conference 2019 taking place April 10 and 11, 2019 in Ontario, California. Yolanda Carrillo is a dynamic Chief Executive Officer of the Corona-Norco Family YMCA since 1998. (She is the first Hispanic Woman CEO for the YMCA’s in the State of California) She is a highly motivated community builder, hard working professional with proven administrative and organizational abilities. She is an effective leader with the ability to organize the efforts and good will of others. She is an enthusiastic team builder who enjoys the challenge of researching and analyzing to find viable solutions to help with the complex problems in the lives of today’s children, families and communities. Her professional growth and development has taken her through many journeys and experiences that have given her a remarkable understanding of human development and community development. She has worked for the federal government in the Social Security Administration. She has worked as a legal assistant for the National Labor Relations Board. She first ventured into working with children at a local community college, and later for two school districts. She began her YMCA career in 1996 in Redlands. She moved to Corona in 1997 and promptly began employment with the Corona-Norco Family YMCA. She holds a dual Master’s of Science degree in Organizational Leadership and Community Psychology. She graduated with honors. She has a Bachelor of Science degree in Human Services. She is a proud holder of a Child Development Program Director Permit. She has taught at a four-year college. Yolanda built the Corona-Norco YMCA from one program site to today’s Y that operates out of twelve program sites. The Y sites are located in Home Gardens, Corona, Norco, Eastvale and Jurupa Valley. The Y now brings dollars from the federal, state, county, and local city governments to help with fulfilling the Y’s mission to serve as many community members as possible. The Y now has realized its goal of creating a continuum of care for families and their children from ages 6 weeks old to high school age. Yolanda holds true the mission and values of the work she tends to on a daily basis of youth development, healthy living, and social responsibility. Yolanda came from very humble beginnings and has become a woman of influence without a doubt. Yolanda has been one of the most influential woman of her time in the City of Corona and in Western Riverside County. She has literally touched, helped, educated, mentored, and modeled for thousands of youth, adults, and citizens at large. Nominated by C.C. Vest a past Hispanic Lifestyle Survived and Thrived Business honoree.